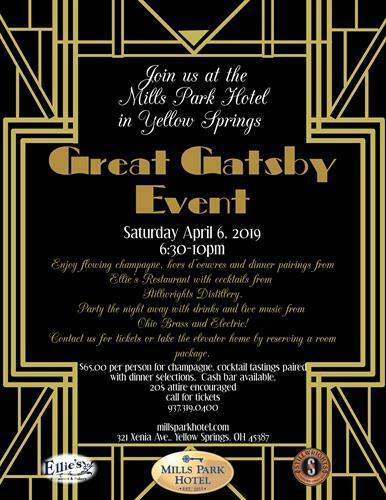 Mills Park Hotel in Yellow Springs will be hosting the Gatsby Event of the year. Enjoy flowing champagne, hors d'oeuvres and dinner pairings from Ellie's Restaurant with cocktails from Stillwrights Distillery. Party the night away with drinks and live music from Ohio Brass and Electric! Contact us directly for tickets or take the elevator home by reserving a room package. Tickets are $65.00 per person-20's attire encouraged.